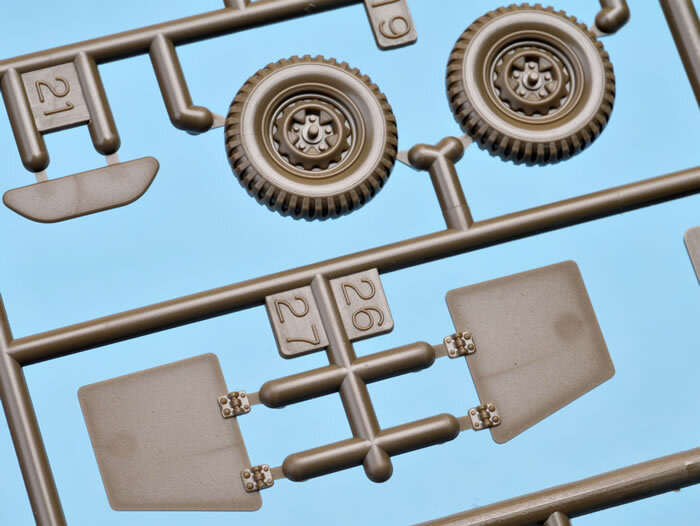 Advantages: Simple parts breakdown but well detailed; includes poseable hull hatches and figure. The BA-64 was a 4×4 light armoured car, employed by the Soviet Army from 1942 into the early 1960s for reconnaissance and liaison tasks. The initial BA-64 model was based upon the GAZ-64 jeep and fitted with sloped armour that had some similarities to the German Sd.Kfz. 222 design. One captured Sd.Kfz. 222 was transferred to GAZ for examination and analysis on 7 September, 1941. 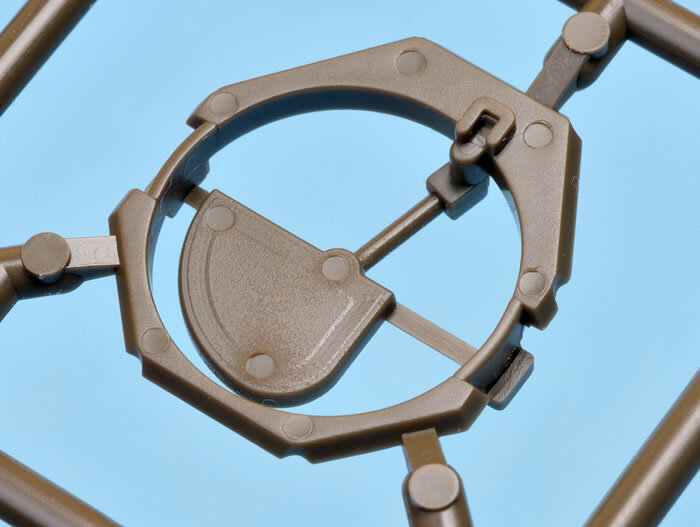 The first prototype was tested on January 9, 1942. The hull had an open roof, with a pintle-mounted 7.62mm DT machine gun. The vehicle was operated by a crew of two. The State Defence Committee adopted the BA-64 for Red Army service on 14 March, 1942, but it was top-heavy and could easily overturn on rough terrain. The improved BA-64B model was introduced in 1943, based on the GAZ-67B jeep, with a wider wheelbase. This model also had a small machine-gun turret added. The mass production of BA-64Bs continued through the rest of the Second World War and ceased in 1946. The last 62 vehicles were completed in that year. BA-64Bs were also used by Polish and Czech units, raised in Soviet Union. After the end of the war, some BA-64Bs were transferred to the police of East Germany. There were other post-war transfers of BA-64Bs to North Korea, China and Yugoslavia. The BA-64 remains in use with the Korean People's Army Ground Force. The BA-64B was nicknamed 'Bobik' by its crews. BA-64s were successfully utilised in reconnaissance and liaison missions despite their light armour and armament. One benefit was the high elevation angle of the DT machine gun in complement with high speed and good manoeuvrability, which allowed BA-64s to be used in urban combat with success against enemy infantry hiding on the upper floors of buildings. 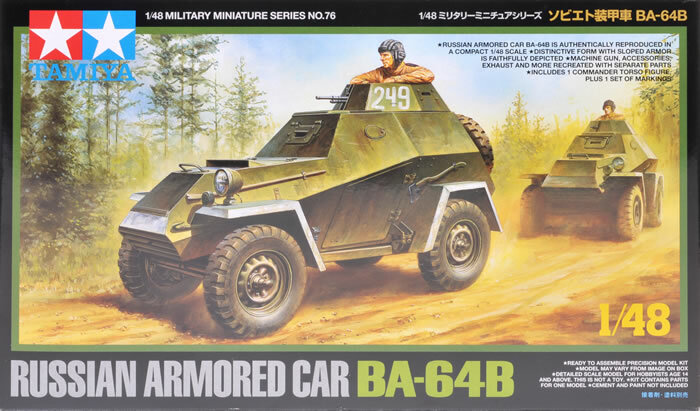 Tamiya’s latest contribution to 1/48 scale military modelling is an all-new BA-64B Russian Armoured Car. 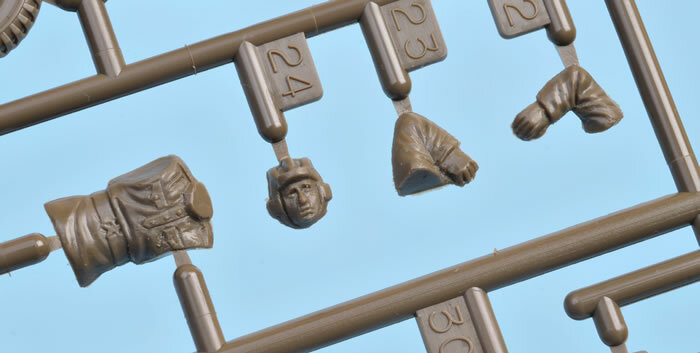 Supplied on a single sprue, the kit comprises 42 parts in khaki coloured plastic, which includes four parts for the Commander half-figure. The model features separate side hull doors and driver’s visor, although no interior is provided. 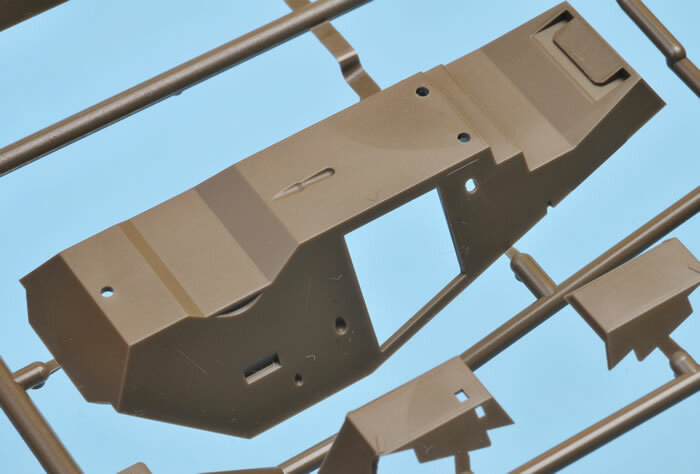 The chassis and leaf springs are supplied as a single part, with the rear axle and front suspension, including the steering fixed in the straight-ahead position, offered as one part each. Surface detail is by way of crisply recessed panel lines and exquisite little hinges. 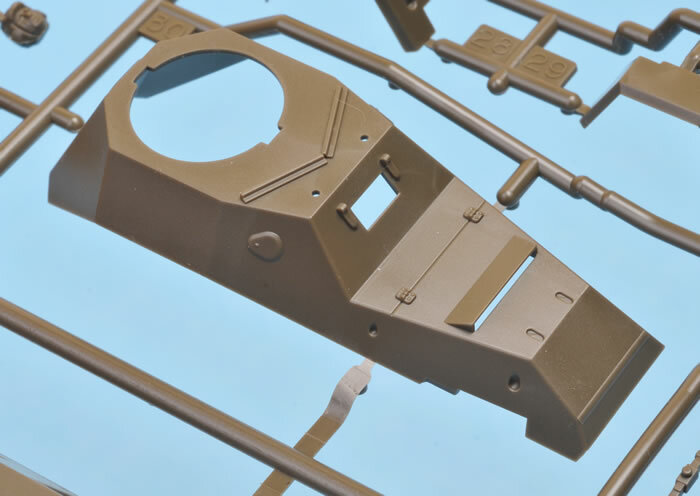 Ejector pin circles are limited to the insides of the doors and the turret floor, so they’ll be hidden when the model is built. 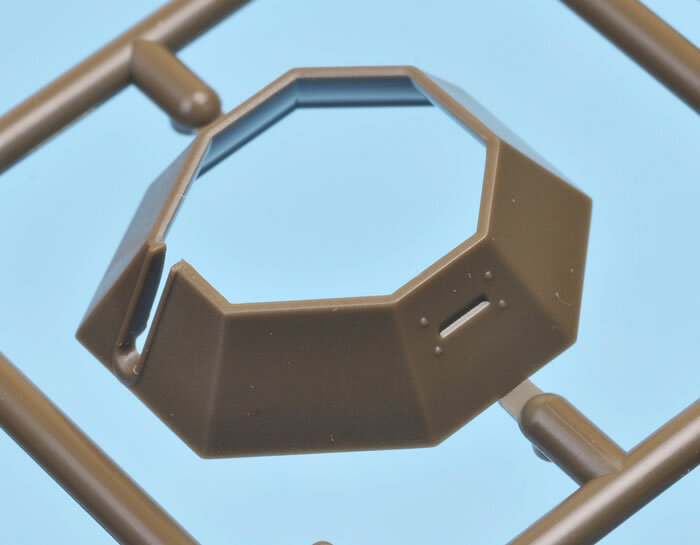 The tyres are moulded in polystyrene plastic and the hub and tread texture looks excellent. A spare tyre is included too. 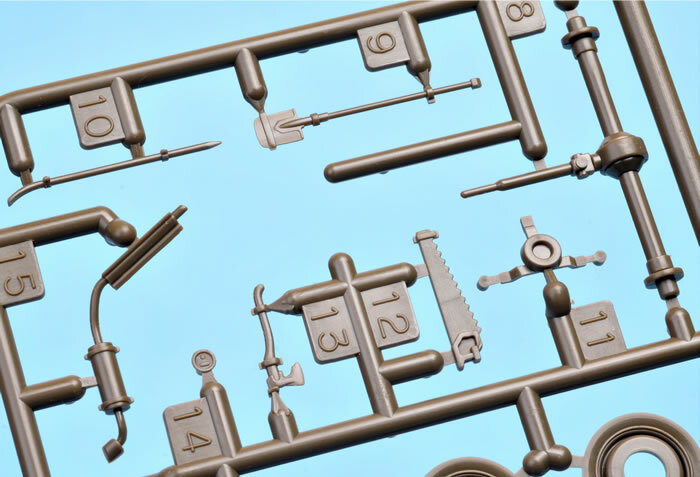 The tools are separate on the sprues, and include a saw, a shovel and a crowbar. The headlight features a separate solid lens, but it will be a simple matter to replace this with a clear or reflective item from Little Lenses, Elf or M.V. Products. The open turret is broken down into two parts, with the Commander’s seat moulded to the base. 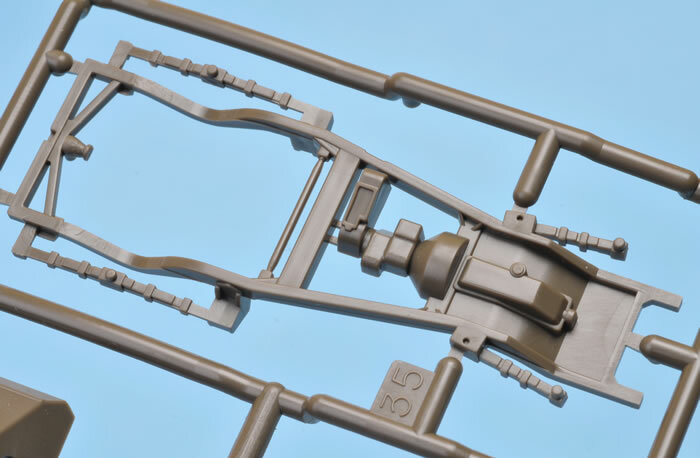 The pintle-mounted 7.62mm DT machine gun is well represented in this relatively small scale. The four-piece Commander looks good, and he may be posed with his elbows on the rim of the turret. Markings are supplied for a single vehicle – 249. 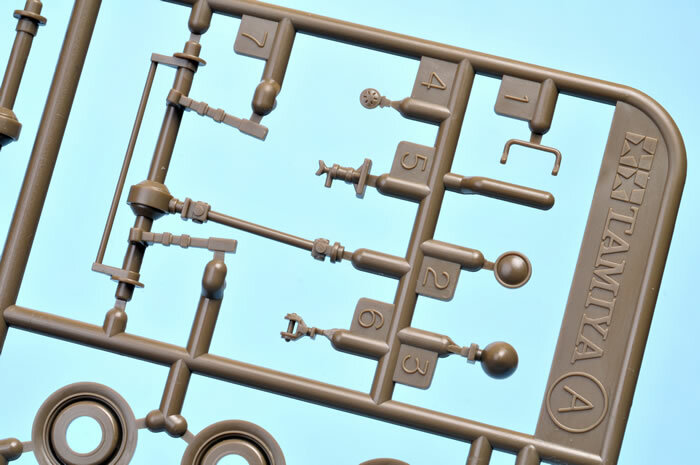 This looks to be an easy to build and nicely detailed kit of a significant Soviet wartime and post-war vehicle. It is great to see this BA-64B in Tamiya's growing 1/48 scale line-up.